Love them or hate them, the fact is that we can no longer ignore hybrid vehicles. Apart from making environmentalists happy, car manufacturers are using this technology to improve the performance and efficiency of their vehicles. A hybrid has more than one source of power - an internal combustion engine and an electric motor. The Volvo XC90 T8 Excellence is a petrol-electric plug-in hybrid vehicle. Currently, it is the only full-size luxury plug-in hybrid SUV on sale in India. Priced at `1.25 crore (ex-showroom, Delhi), it comes equipped with a lavishly appointed cabin, an array of convenience and safety features, and its two power sources have a combined output of 407PS and 640Nm. How does it feel to drive on our roads? 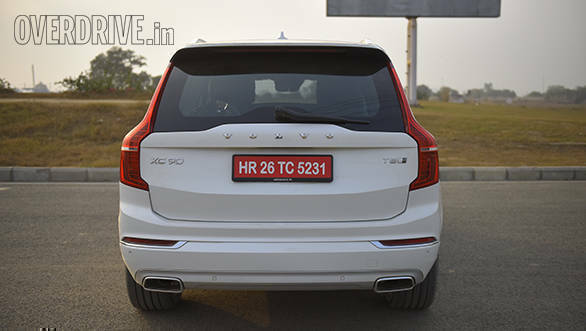 In terms of design, the plug-in hybrid version of the XC90 retains all the styling cues of the petrol-powered version. 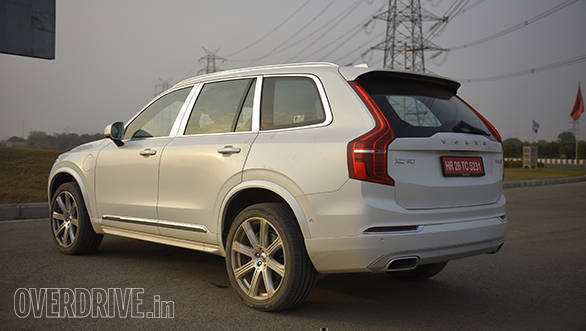 So, irrespective of which angle you choose, the XC90 T8 hybrid is handsome. The T-shaped 'Thor's hammer' inspired headlamps along with the large oval grille not only look stunning but also make it stand out among its peers. The big LED tail lamps are perfectly chiselled and along with the quad exhausts are as stunning as the front. The best bit is the tight and clean lines which do a splendid job at hiding the length of the car which is almost a good five metres. 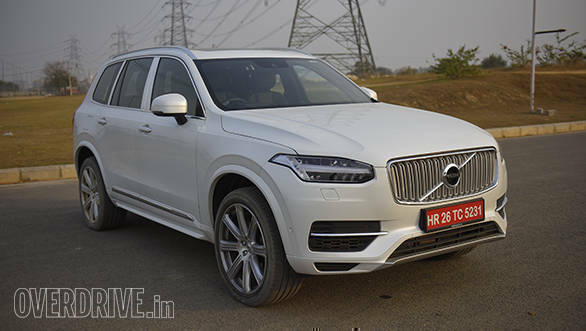 The XC90 T8 Excellence plug-in hybrid retains the same cabin as the petrol-powered version. There's the layered leather-wrapped dashboard which uses soft-touch materials. It gets a 9-inch touchscreen infotainment system called the Sensus Connect which lets one control various functions of the car. The key difference between both variants is that the T8 Excellence is available in only a 4-seater configuration. 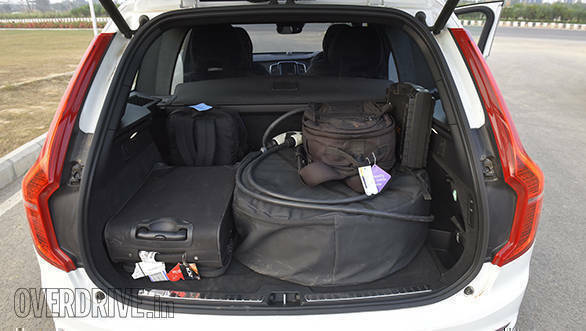 Compared to the regular petrol version, the four seats in the XC90 hybrid get more legroom. 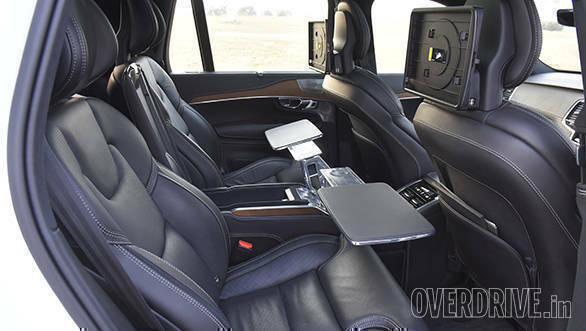 Also, each seat offers heating, ventilation, reclining and massage functions. Every seat is draped in perforated nappa leather and is electrically adjustable. The cabin is very well insulated, and barely any tyre roar or engine noise filters in. The boot section has been separated from the cabin by a glass partition. This ensures that the rear seat occupants are in a world of their own. What makes the cabin truly a special place is the opulent detailing. The Orrefors crystal gear shift knob is beautiful to look at. To start and switch off the car, one need not press a button. Instead one needs to merely twist a diamond-cut knob located below the gear shift knob on the centre console. 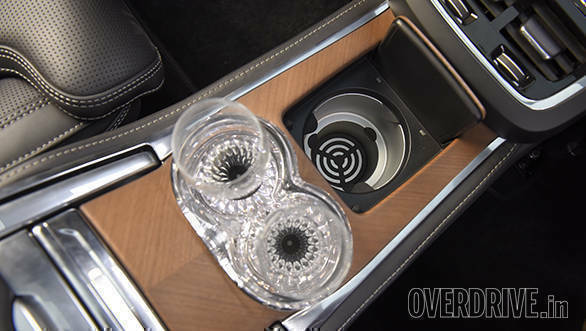 Between the rear seats, Volvo has cleverly placed a beverage cooler which can hold two 750ml bottles. It also houses two handmade Orrefors crystal glasses. 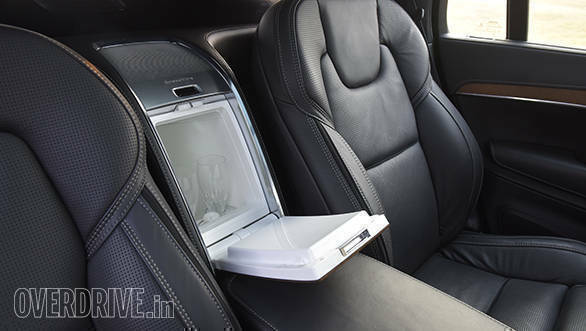 The rear centre armrest houses a touchscreen console which allows occupants to toggle between different entertainment options and control the cooler's temperature. The 1,400W 19-speaker Bower & Wilkins sound system is an audiophile's dream come true. It replicates the Gothenburg concert hall, and no matter which track you play, it simply sounds splendid. All Volvo cars feature exceptionally comfortable seats as the manufacturer works with orthopaedic surgeons to design their seats. On the XC90, the large seats are perfectly cushioned and offer an excellent amount of support. The Volvo XC90 is based on the carmaker's Scalable Product Architecture (SPA) platform. It was developed to accommodate a hybrid powertrain. Its T8 engine is a combination of a 2.0-litre 4-cylinder petrol engine and an electric motor powered by a Lithium-ion battery. The direct-injection petrol engine is turbocharged as well as supercharged and makes 320PS of power. The electric motor generates 87PS and 240Nm of torque. 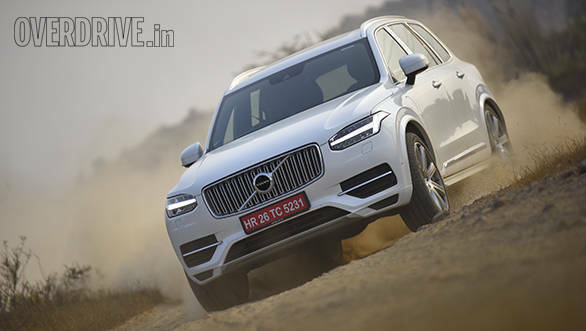 That gives the XC90 T8 hybrid a combined output of 407PS and 640Nm of torque. The engine comes mated to an 8-speed Aisin gearbox which shifts seamlessly when driven in a relaxed manner. It works wonderfully in traffic and when a chauffeur drives you around. However, when you stamp on the accelerator, the Aisin takes a palpable moment before it selects a lower gear and pushes forward with purpose and verve. For an SUV that tips the scales at over two tonnes, the numbers translate into brisk performance. During our performance tests, the XC90 T8 sprinted to 100kmph in 6.1 seconds, which is quick. It took just 3.95 seconds to complete the 30-80kmph run and 4.2 seconds to accelerate to 120kmph from 80kmph. In terms of efficiency, it delivered 9.8kmpl in the city and 11kmpl on the highway. Again, a full-bore in-gear overtake when you have the hybrid mode selected makes the powertrain pause a moment before the 640Nm asserts itself  almost as if the electronics take a moment to decide how best to deliver all the performance available. That said, these quirks only manifest when you have the throttle buried in the carpet not otherwise. There are six driving modes to choose from  AWD, Pure, Hybrid, Power, Off-road and Individual. In Pure mode, the XC90 T8 Excellence is driven only by the electric motor and has a limited range of up to 40 kilometres. If the mode detects that more power is required, then the petrol engine comes to the aid of the electric motor. The regenerative braking function utilises the energy generated during braking to charge the battery. In Hybrid mode, the vehicle alternates between utilising the battery and petrol engine as an energy source. As the name suggests, in Power mode both engines are utilised to deliver brisk performance. The petrol engine powers the front wheels while the electric motor powers the rear wheels. The battery can be fully charged in 2.5 hours by plugging into the Volvo charging station (included in the price of the XC90 T8) which will be installed by the manufacturer at your home and another one at the office. Between the engine and the gearbox lies a crankshaft-mounted starter generator which also allows a smooth transition from electric to a petrol-electric drive. In the real world, the transition between the electric and power motors is indeed very slick. The only way by which you can tell that the vehicle is relying on the petrol engine is by its roar at high revs. Step on the accelerator, and the XC90 gushes forward with enthusiasm which contradicts its weight and size. Executing overtaking manoeuvres requires a gentle flex of the right foot. The brakes offer good feedback and the pedal has very little play. It came to a complete halt from 100kmph in 2.8s while covering 39.75 metres. Just like the diesel-powered XC90, the plug-in hybrid version too gets air suspension as standard. That translates into a really quiet and comfortable ride over various surfaces. Even over broken sections and undulations, the ride stays composed. The suspension does a brilliant job at soaking up the shocks from road imperfections. Expect when you end up driving through a deep pothole or rut at speed which causes the suspension to crash through. For an SUV that weighs over two tonnes, the body roll is as much as one expects. However, it does not get to the point of making one uncomfortable. The light steering makes it easy to drive in the city and especially while parking into tight spots. As speeds build, the steering weighs up but not as much as we would have liked it too. 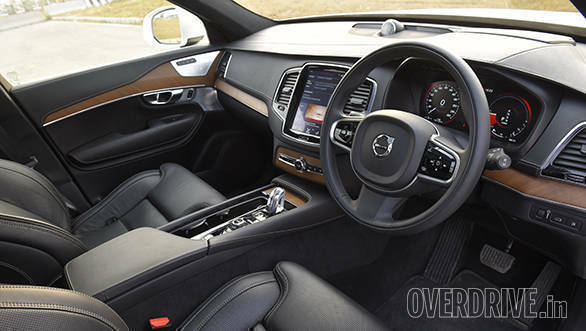 The XC90 T8 Excellence plug-in hybrid is the more spacious and opulent version. The well-appointed interiors get many unique features. Being a Volvo, it comes packed with a host of safety features like adaptive cruise control, collision detection, pedestrian detection, and large object and animal detection, to name a few. 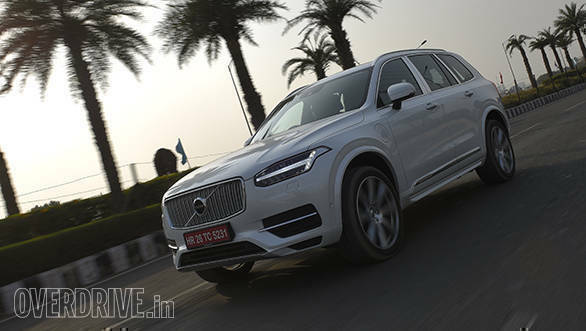 The regular XC90 appeals to an elite group of car buyers who don't need to stick to a budget. It is for those who seek exclusivity, grandeur, comfort and prefer to be cocooned in a world of their own. The XC90 T8 Excellence hybrid takes the game forward by delivering brutal but luxurious performance while ensuring carbon emissions are low. It can be driven in electric mode to keep the environmentalist in you, happy. When the battery runs out of juice, the refined petrol motor will seamlessly come into play. It is a relaxing, enjoyable and flamboyant mode of transport. Priced at `1.25 crore (ex-showroom, Delhi), it is worth every penny.